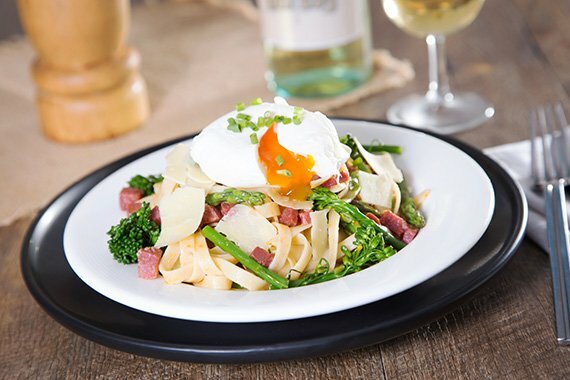 This is a simple but delicious pasta dish, with the addition of an poached egg (optional) is quick to make. The gooey egg yolk, combined with the chorizo, garlic and parmesan are a delightful flavour combination. You do require a little bit of organisation with your timing with this one, so be sure to read through the recipe first, before starting. (TIP: The fresher your eggs, the better they will hold their shape when poaching). Share your moment at #youplateit with us on Instagram and make your friends jealous. In a deep sided pan, heat olive oil over medium-high heat. As it starts to shimmer, add chorizo. Reduce to medium heat, cooking for 3 - 4 minutes. Add garlic, cook for 1 minute more. Remove pan from the heat and cover to keep warm. Cook pasta in the large pot of boiling, salted water. Add broccolini and asparagus after 3 minutes and continue cooking pasta until tender, about 6 minutes in total. Drain and reserve ¼ cup of cooking liquid. Return pasta and broccolini to the pot and cover to keep warm. (Optional): In the meantime, boil kettle and half fill a small pot with boiling water and add vinegar, over low heat. Break one egg into a cup and pour egg into the hot water at the side of the pot. Repeat with remaining egg(s). When eggs are in the pan, return water to a slow simmer. You’ll see them begin to cook immediately. A really soft poached egg should take around 2 minutes and a soft to firm one will need 4 minute. Turn off the heat and remove egg with a slotted spoon and rest on paper towel to soak up any excess liquid. Add cooked pasta, greens, chopped chives and parmesan (reserving some for garnish) to the pan with chorizo. Add reserved pasta cooking liquid (as needed) to coat the pasta. Heat over low heat until combined and warmed through. Season with salt and pepper. Divide pasta between bowls and top with poached egg (if using), garnishing with parmesan and chives. Enjoy!